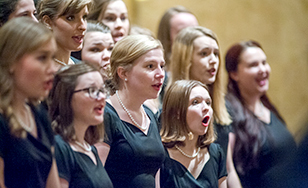 St. Scholastica's choirs will perform a "Celebrate Spring" concert at 7:30 p.m. Thursday, March 8 in the Mitchell Auditorium. "Celebrate Spring" is the choirs' mid-semester concert, and will feature the Vox Anima women's Choir, Contus Corae men's choir, and Bella Voce. The program will be directed by Dr. Sarah Ludwig, assistant professor of music, and Dr. Bret Amundson, director of the music and general education programs at St. Scholastica. The musical selections will span cultures and times to offer a breath of fresh air amid the changing season, and will feature familiar titles such as "Simple Gifts," "Blue Moon," and choral favorites by Eleanor Daley, Joan Szymko, Pergolesi, and more. Admission is $5. For more information, visit spotlight.css.edu or call (218) 723-7000.